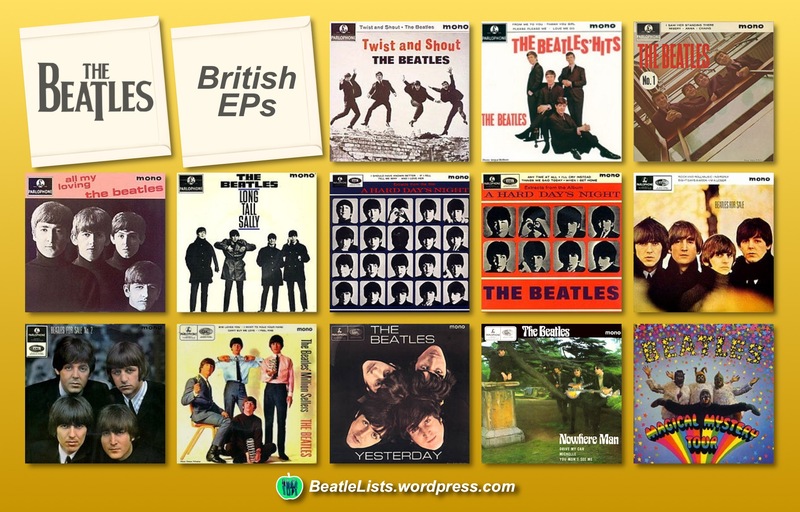 The Blog of Beatles Lists | Lists, Stats, Charts …and more! 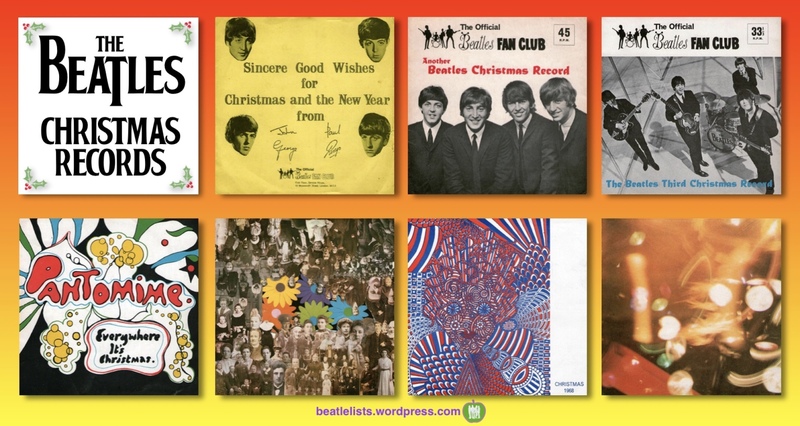 Between 1963 and 1969 The Beatles released seven Christmas records exclusively to their UK and US fan club members. 1967 : Christmas Time Is Here Again! 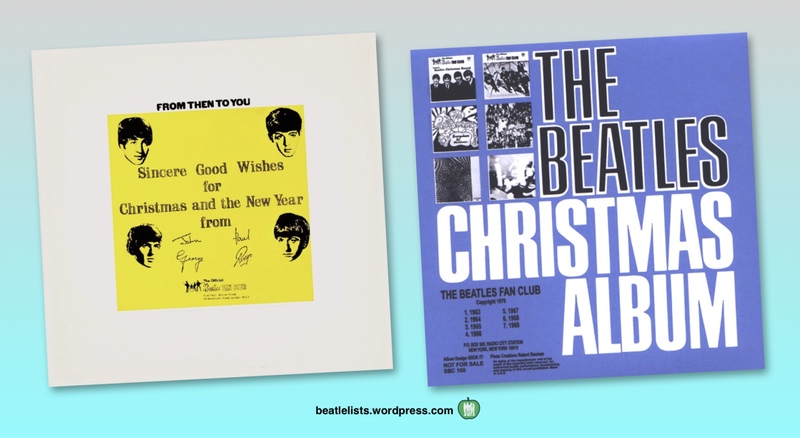 The format for the 1963 to 1965 records is largely the same – mostly spoken word and featuring The Beatles thanking their fans, attempting several improvised and ad-libbed versions of well-known Christmas songs (‘Good King Wenceslass’, ‘Jingle Bells’, ‘Auld Lang Syne’, etc.) and generally goofing around. Later records got a little more creative – Pantomime – Everywhere It’s Christmas (1966) is a series of skits and sketches linked by a repeated original song fragment (“Everywhere it’s Christmas at the end of every year…”). Christmas Time Is Here Again! (1967) is again built around an original song and includes The Beatles playing several characters singing songs (‘Plenty of jam jars’), acting a radio drama (‘Theatre Hour’) and reading poems (John’s ‘When Christmas Time Is Over). Contributions for The Beatles’ 1968 Christmas record were recorded separately. Paul sings what is probably an improvised Christmas song (‘Happy Christmas, Happy New Year’) and John reads a couple of his poems (‘Jock and Yono’ and ‘Once Upon a Pool Table’). George’s section was recorded in Los Angeles and includes a unique rendition of ‘Nowhere Man’ by Tiny Tim. Ringo’s contribution is a slightly anarchic skit with little apparent connection to Christmas. The final Beatles Christmas record Happy Christmas 1969 was also recorded separately as the band had effectively split up by Autumn 1969. John and Yoko feature heavily, Paul sings another improvised song (‘This is to Wish You a Merry, Merry Christmas’) but George and Ringo hardly feature (Ringo’s only real contribution is a crass attempt to plug his then-current film ‘The Magic Christian’). In 1970 the British and US fan clubs issued compilations of all seven Christmas records with different sleeves and titles but identical content. None of the Christmas records have been officially released but an edited clip from the 1963 record is used in the closing credits to the 2016 film The Beatles: Eight Days A Week – The Touring Years. 1967: Christmas Time Is Here Again! Glyn Johns compiled four known versions of material from the January 1969 Get Back / Let It Be sessions. Glyn Johns was the engineer and producer hired by The Beatles in January 1969 to work on the project that was eventually released in 1970 as the album and film Let It Be. The sessions had started with no real title or overriding concept but at some point during (or possibly after) the process they became known by the title Get Back. Johns is known to have compiled at least four collections of recordings during and after these sessions. Johns‘ first compilation may have been put together as early as 29 January 1969 and differs from subsequent versions in that it includes two complete takes of Get Back and a version of Jimmy McCracklin’s The Walk, but it omits One After 909 and Dig It. It was almost certainly not intended for release and was more likely a ‘reference’ to allow The Beatles to hear how the tracks sounded on record. 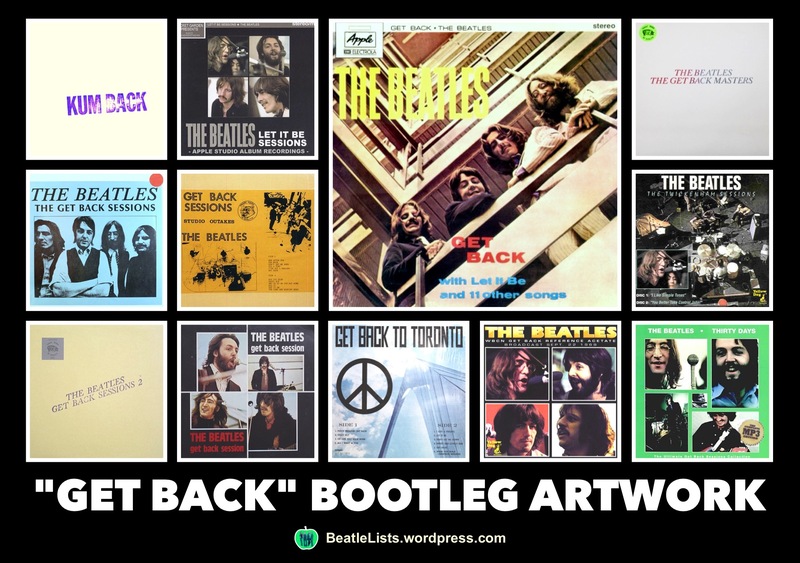 This compilation formed the basis of the first known Beatles bootleg towards the end of 1969 under the title Kum Back. The second Glyn Johns compilation was assembled in early March 1969 and it’s probably the first the be mixed and compiled with a view to possible release. The track list of this version formed the basic template for the two subsequent compilations by including One After 909, Rocker , The Last Dance For Me and the short closing reprise of Get Back. All known bootlegs of this compilation sound in mono but only feature one channel of the original stereo mix. The third Get Back compilation was mixed and compiled by Glyn Johns on 15 and 28 May 1969. 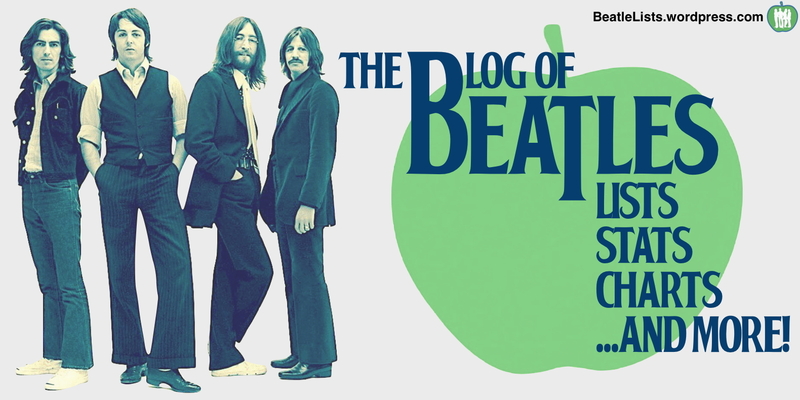 The track list is identical to the second version but a number of differences occur in the actual mix, the most significant being the replacement of Johns’ earlier mix of Get Back with his and Paul McCartney’s April 1969 single mix (but with different introductory chat). Elsewhere, a few bits of dialogue are amended and just over a minute is trimmed from the beginning of Dig It. Although ultimately unreleased, Beatles connoisseurs generally consider this to be the definitive version of the Get Back album. The fourth and final unreleased version of Get Back was mixed and assembled by Glyn Johns on 5 January 1970. It differs from the three earlier versions in that it omits Teddy Boy whilst including the newly recorded I Me Mine and a remix of Across The Universe. Neither of these last two tracks originate from the January 1969 Get Back sessions but the inclusion of rough versions in the final cut of the Let It Be film necessitated their addition to the accompanying soundtrack album. The other major difference is the new vocal overdub on For You Blue, although this mix curiously still includes parts of the original vocal. Something close to this version of the album may have received an official release had John Lennon not invited Phil Spector to clean up and ‘reproduce’ the original Get Back tapes in March 1970. This illustration shows artwork from several bootlegs of Get Back material. With one possible exception these are all unofficial and unauthorised designs and the actual recordings represented on these records/CDs/downloads include a mixture of Twickenham and Apple rehearsals from nagra tapes and Apple multi-track recordings. The main cover shown here pastiches Angus McBean‘s 1963 Please Please Me cover shot and typography and this, or something close to it, may have been prepared in anticipation of an official release of Glyn Johns‘ final compilation. These EPs are 7″ vinyl ‘extended play’ records running at 33⅓ rpm and sit alongside the standard Beatles discography of LPs and singles. They typically containing four tracks from the most recent Beatles album and occasionally include a contemporaneous single. Long Tall Sally was the first Beatles EP to contain exclusively new material and Magical Mystery Tour, issued as two discs in 1967, was the last EP in their core catalogue. EPs might have been an additional means of promoting, or a budget alternative to, existing full-length albums but the release dates may suggest otherwise. The two EPs featuring extracts from A Hard Day’s Night weren’t released until four months after the album of the same name. Similarly the two Beatles For Sale EPs were issued four and six months after their source album and both the Yesterday and Nowhere Man EPs emerged a full seven months after their respective parent albums Help! and Rubber Soul. Given the high turnover of Beatles releases up to mid-1966 it doesn’t seem likely that Parlophone would still be aggressively promoting existing albums when new product was already completed and being readied for release. Indeed, in most of the instances stated above, a brand new full-length Beatles album would appear within little more than a month of the EPs (two months in the case of the Beatles For a Sale No.2 EP and Help! album). 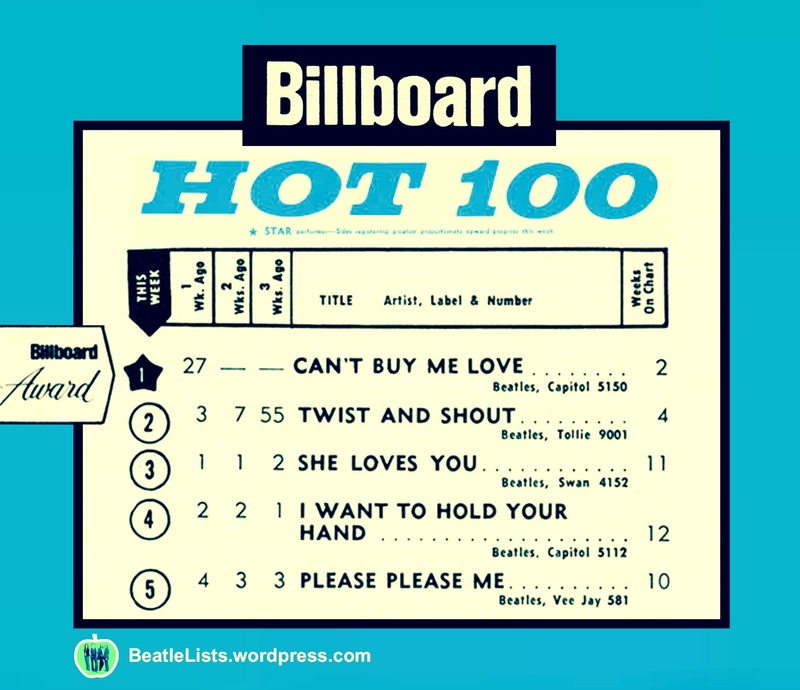 One of the more remarkable achievements of The Beatles‘ early years occurred on 4 April 1964 when they held the top five places in the US Billboard chart. What’s interesting is that only two of these singles were on the Capitol label – the US arm of EMI, The Beatles‘ British label. Please Please Me had been The Beatles‘ first US single on the Vee Jay label in early 1963 after Capitol chose not to exercise first refusal on the option offered by EMI for US release. Similarly, She Loves You had been licensed by EMI to Swan Records later in 1963. Neither single bothered the Billboard chart until the success of I Want To Hold Your Hand boosted their initial modest sales (and prompted Vee Jay to issue Twist And Shout on their Tollie imprint) in early-1964. Can’t Buy Me Love, Capitol‘s second Beatles single, completed the monopolisation of the top five – an achievement that remains unmatched in the United States to date. 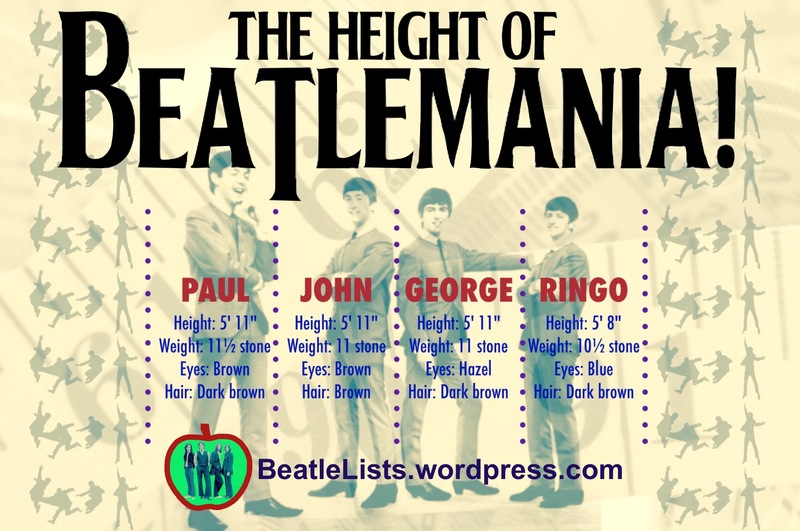 Just how tall were The Beatles? 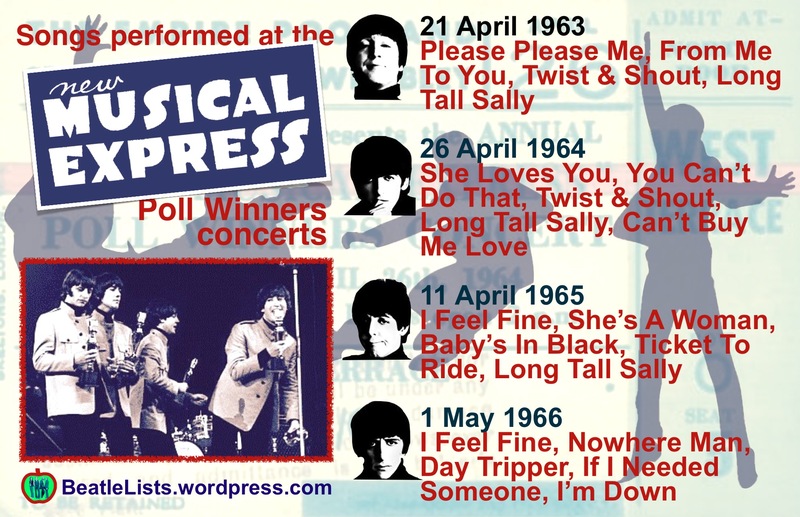 Sources tend to vary as to the actual heights of the individual Beatles, but these are the numbers that appeared on their first Parlophone press biog in late-1962. The same press release also revealed that Paul’s favourite food was “steak and chips”, John’s hates were “thickheads and traditional jazz”, George’s favourite companion was “girls” and Ringo’s ambition was “to get to the top”! The Beatles catalogue first appeared on Spotify (and several other streaming platforms) on 24 December 2015. 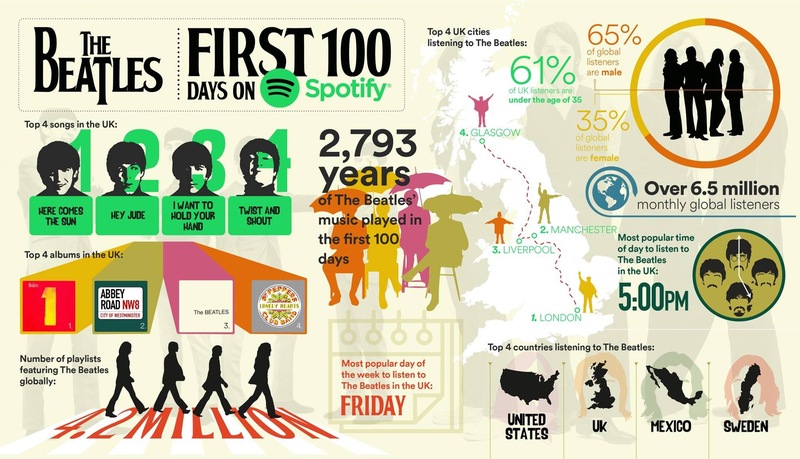 This infographic shows some of the stats generated by Spotify users in the first 100 days of streaming. The Grammy Awards are the premier American music awards presented annually by the National Academy of Recording Arts and Sciences since 1959. Given their ubiquity in the American charts through most of the 1960s it’s surprising that The Beatles won relatively few Grammys for their work during that decade. This list includes several collaborators – producers, engineers, designers – who received awards for their contributions to The Beatles’ US catalogue and awards given to individual Beatles for their work on Group projects. It does not include awards for The Beatles’ solo releases from the early-70s onwards. The Anthology and related releases resulted in belated awards in the late-90s and The Beatles received a long-overdue Lifetime Achievement award in 2014.